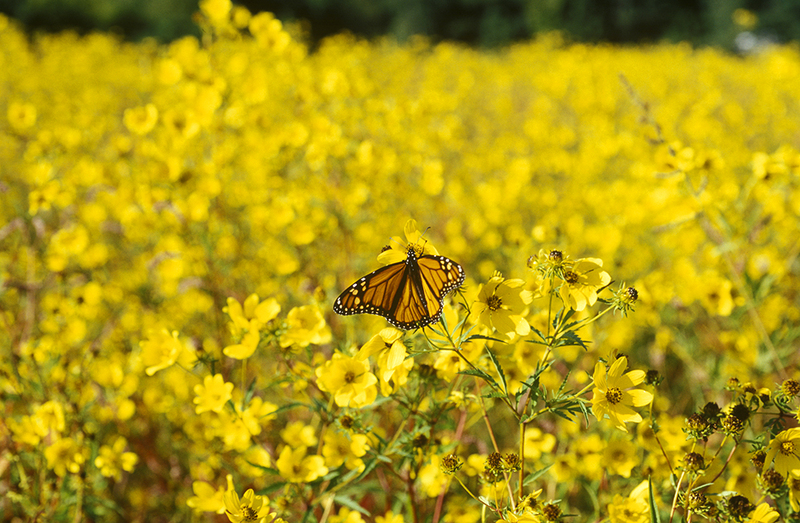 Well, the Google Doodle beat me to the punch yesterday, marking the 41st anniversary of the discovery of the overwintering site of the Monarch butterfly. But that’s OK, I’m going ahead with this anyway. 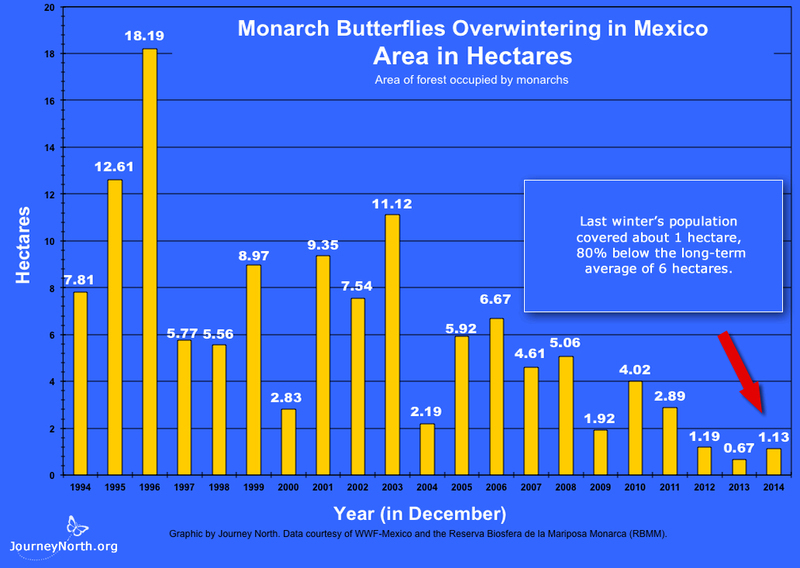 By the mid-20th century the existence of the monarch migration had been well known for many years, but not its full route. 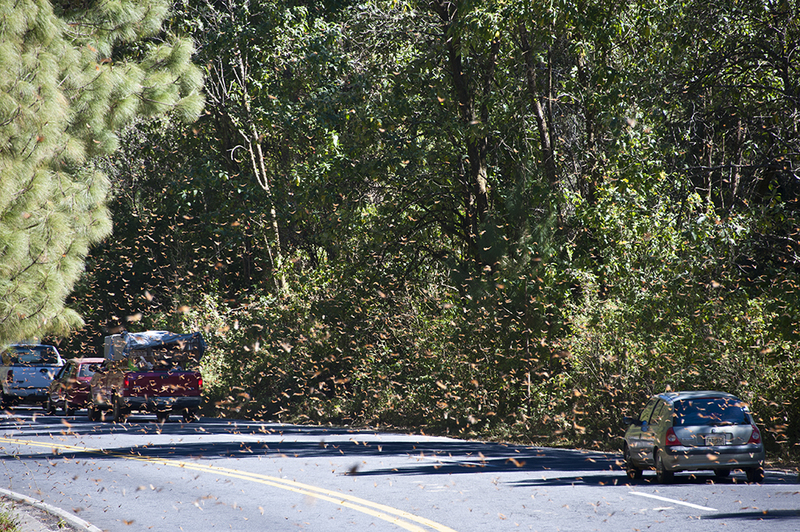 Every August and September, millions of monarchs in the eastern United States and Canada would start flying south toward Mexico and disappear. Then, around March, they would reappear on a northward journey. The location where they spent those intervening months was unknown. It was one of nature’s great mysteries. 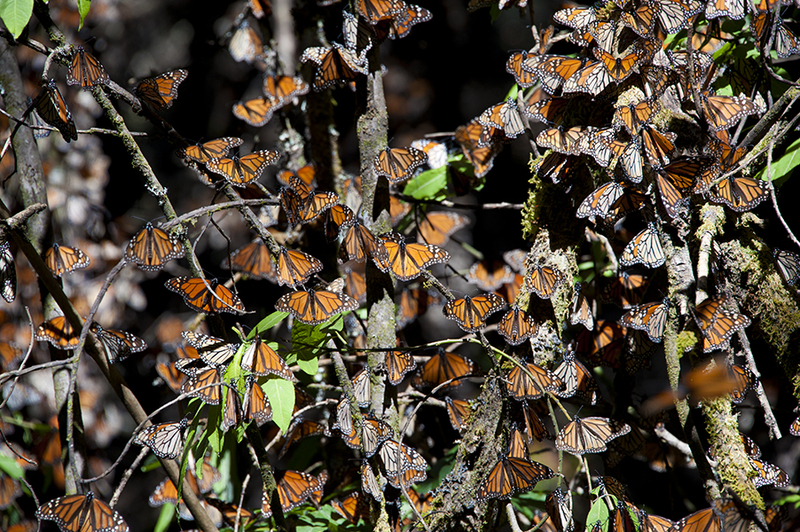 In that year, a group of scientists following clues left by tagged butterflies that had fallen on the journey south were led to a place high in the mountains of Mexico’s eastern Sierra Madre Mountains. 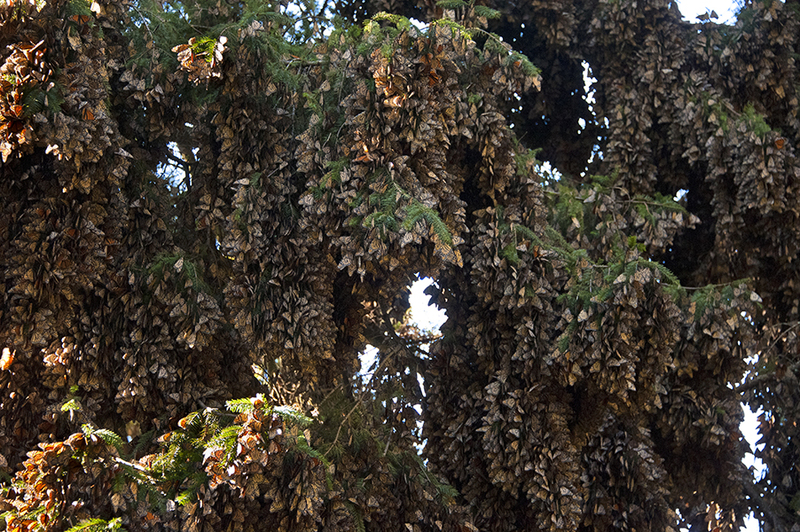 There they found millions of butterflies clinging to the branches of the oyamel trees that grow at altitudes as high as 11,000-12,000 feet. The fact that these small creatures can actually make the trip of several thousand miles is not the most amazing part of the story. What is most incredible is that none of them had ever been there before. 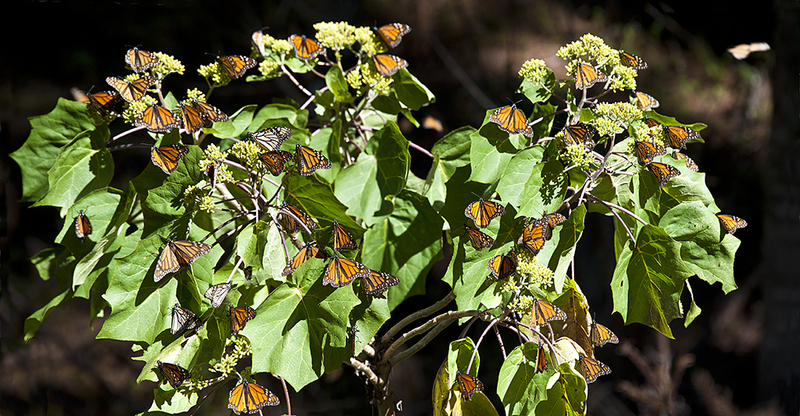 Yet each year a new torrent of monarchs, separated by three or four generations from those that flew there the previous year, finds its way to those same oyamel trees. 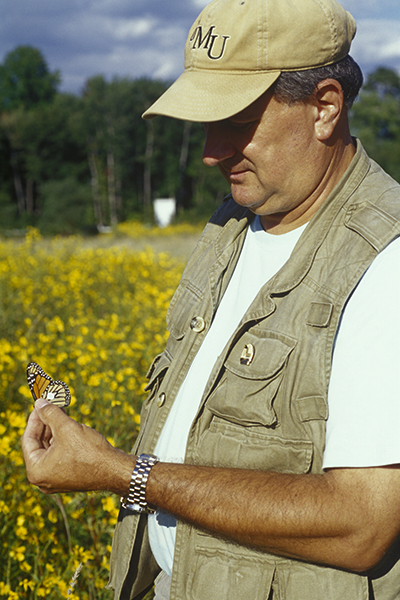 I became entranced with this story in 2001, after reading “Four Wings and a Prayer” by Sue Halpern who traveled to Mexico in a truck with legendary monarch tracker Bill Calvert and experienced first-hand the spectacle of the monarch migration. My own journey started shortly afterwards with a trip to Cape May, New Jersey, a key crossing point for the southbound monarchs over Delaware Bay. Butterfly researchers at the Cape May Bird Observatory demonstrated the technique of tagging the monarchs and how the tracking depends on anonymous individuals who find a tagged butterfly and report the information of where and when to research centers. 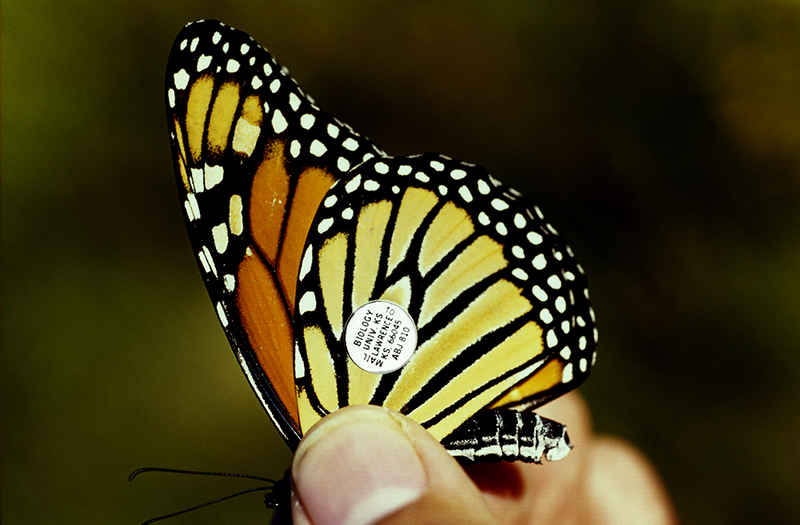 reached his annual goal of 500 taggings, but was despondent over the fact that this waystation for the monarchs was about to become a shopping center. Seven years later, I was at Pictured Rocks National Lakeshore, on the south shore of Lake Superior, when I spotted a few flashes of orange. 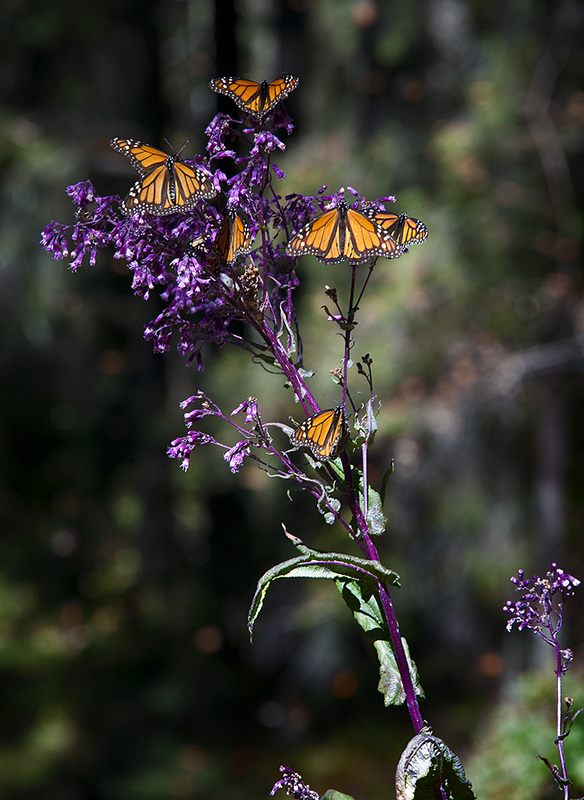 It was a pair of migrating monarchs just arriving from their 100-mile-plus flight across the great lake from Canada. They still were over 2,500 miles from their destination. In the fall of 2010, a friend called asking if I would like to join her on a trip to see the overwintering sites in Mexico. My answer was quick and the following January, we found ourselves on a long bus ride from Mexico City to the mountain village of Angangueo. But this was just the first of many transportation modes we would use in the coming days such as the back of pick-up trucks, riding horses, and finally hiking on our own at lung-busting (to us at least) altitudes of 11,000 feet and higher. But it was all worth it. Photographs really can’t communicate the scale of the scenes we witnessed. 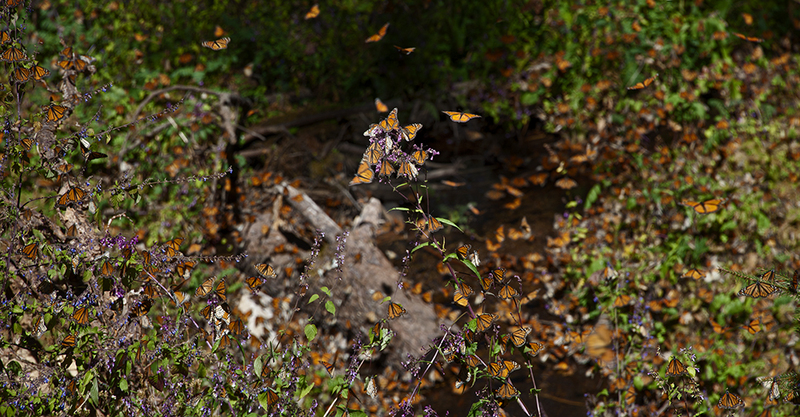 There are so many butterflies clustered on the trees that the branches bend downward from the weight, occasionally even breaking.The image below shows a small section of a stand of trees in one of the preserves. Imagine that no matter where you look from this position, all the trees surrounding you are covered from top to bottom with what seem like orange leaves but really are butterflies. 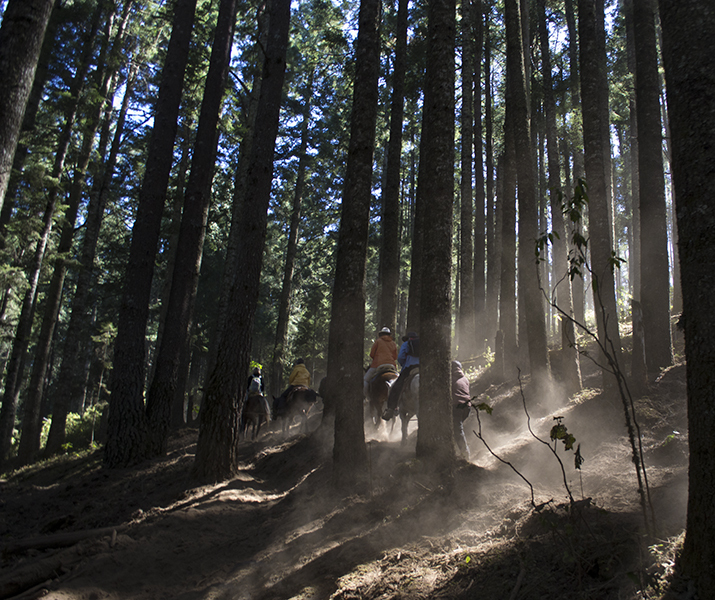 Mexico does try to protect the sanctuaries, although illegal logging is one of many serious threats. 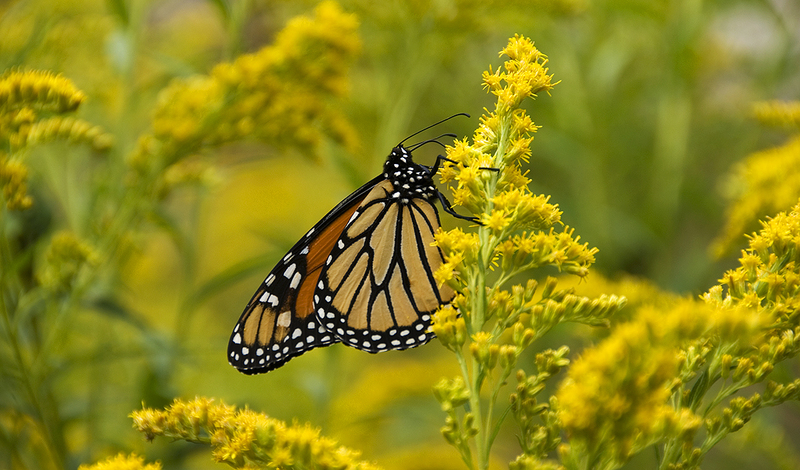 But on the positive side they enforce strict (5 mph) speed limits on a highway that occasionally is also used by the monarchs when searching for water outside the preserves. year. Preliminary estimates for this winter are cautiously optimistic, with hopes that they might reach the levels of 2011, when I was there. Keep your fingers crossed and….